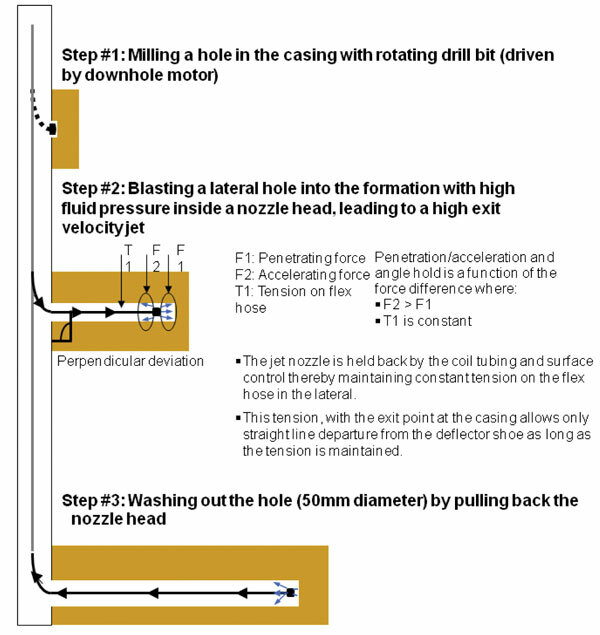 Figure 1: The radial jet drilling procedure begins with the removal of production equipment from the well and rigging up the coiled-tubing unit. The coiled tubing is lowered down the well to the target formation, and the cutter perforates the casing and cement. A high-pressure hose is lowered downhole, and drilling fluid is pumped to erode the reservoir and drill the lateral. 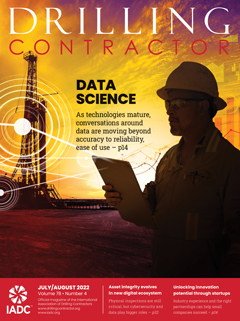 Upward trends in oil prices and the proliferation of new technologies are enabling operators to capitalize on new opportunities. Horizontal drilling and completion are opening up reserves in fields that were not previously economically viable. This trend is not limited to previously undeveloped fields or by lithology. Operators are also able to gain higher recovery from old fields where production has declined over time, making new opportunities for matching technology to economies of scale for such marginal projects. 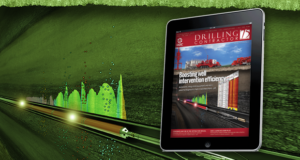 This article outlines the re-completion of a portion of a 40-year-old field using radial jet drilling (RJD). The reservoir is a carbonate formation with low permeability. The combination of low permeability, low productivity from traditional vertical completions in a thin net pay, and lack of low-cost techniques to improve well productivity caused production to dwindle. After acquiring the lease in late 2010, the new operator implemented a program of RJD and acid/nitrogen fracturing to enhance production. or near-vertical wellbore. It works in both new and old wells that already have a production history. The article summarizes the workover effort and production data before and after the workovers. 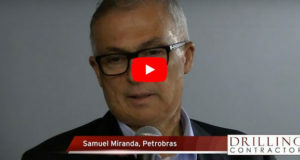 The results show that nearly a two-fold production increase was obtained, and it can be clearly seen that RJD can be a viable alternative to improve productivity of shallow reservoirs that still have significant oil in place. The Donelson West field, located in Cowley County, Kan., covers about 1,200 acres. The target formation is the Altamont limestone, which is in the upper part of the Marmaton group in the Middle Pennsylvanian series. It is a fine crystalline limestone that varies in color from light brown to brownish white. 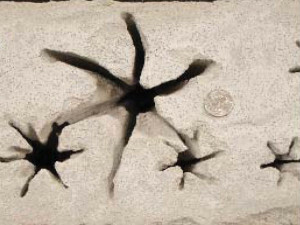 The formation displays some pinpoint and vugular porosity. Formation porosity typically varies from 15% to 20% while permeability varies from 1-10 millidarcies and net pay thickness varies from 6-10 ft. Gas drive is the primary driving mechanism. 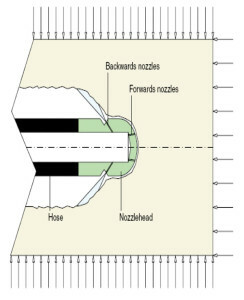 Figure 2 : The nozzle’s forward spray cuts the formation while the rearward spray accelerates the nozzle’s progress into the rock and circulates cuttings. The diameter of the nozzle varies from 0.5 in. to 0.75 in. and is approximately 1-in. long. To date, the field has been on primary depletion. Developing such a field with traditional techniques is expensive and makes it not economically viable. 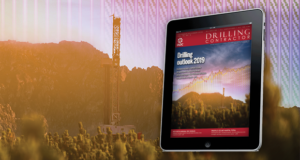 Horizontal drilling and completions has helped increase production in fields that may be uneconomic with traditional completions. However, traditional horizontal techniques may not be suitable in marginal oil/gas reservoirs. RJD can be effectively used to capture the benefits of horizontal drilling in smaller-scale reservoirs. 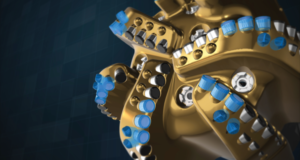 It has been proven to enhance production rates, reduce decline rates, reduce near wellbore damage and recover more resources from stripper wells. Figure 3 : Jet-drilled holes vary in size. Each of the holes was drilled into sandstone with radial jet drilling. 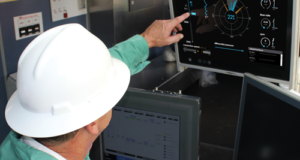 RJD technology is oriented toward existing oil and gas wells in North America at depths of 4,500 ft or shallower. It was developed in response to the need to economically extract more oil and gas from existing wells using a more cost-effective method. Radial jet enhancement has made it feasible to improve production from more than 1.7 million wells that would otherwise be cost-prohibitive to recover. This represents a total potential untapped market of more than $50 billion. matrix acidizing, and for traditional water injection/disposal applications. Figure 4 : A significant amount of tension is placed on the high-pressure hose. The tension pulls the hose tight and ensures a straight bore. 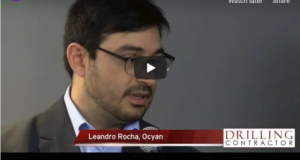 companies in the US, Canada and South America with significant productivity improvement results. 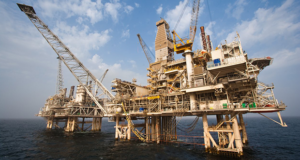 Instead of being drilled with a conventional bit and drilling mud, RJD uses high-pressure water, diesel or acid to be expelled through a high-pressure hose and a nozzle to drill into the formation. 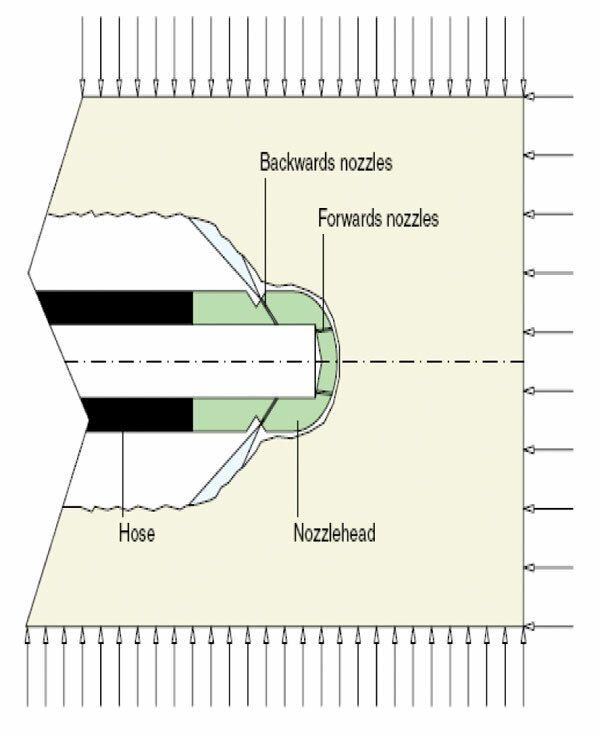 The nozzle has orifices that face forward to cut the rock, and orifices that face backwards at a 45° angle to push the nozzle forward into the formation and to widen the hole behind the nozzle. The hose is delivered down the hole via a coiled-tubing unit (CTU). Figure 1 outlines the RJD procedure. The first step of the drilling process is to remove the production equipment from the well and rig-up the CTU. The end of the coil tubing (CT) is equipped with a 90° deflector shoe that points sideways into the formation when lowered downhole. This deflector shoe is essentially a 90° elbow. The CT is then lowered down the well until the deflector shoe reaches the target formation. In a cased-hole application, a special cutter is lowered into the well by CTU until the cutter reaches the casing. The cutter is then energized to perforate the casing and cement. 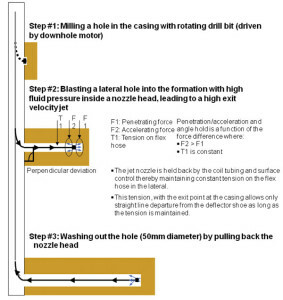 After the casing is penetrated, the high-pressure hose with the jet nozzle can be lowered downhole inside the CT. Once the nozzle has reached the formation, the drilling fluid is pumped through the high-pressure hose and exits the nozzle, which both jets the lateral and advances the nozzle and hose into the formation. The fluid exits the nozzle at very high speeds, erodes the reservoir and drills the lateral. At the end of the process, the pressure in the hose is decreased as the hose is removed from the jetted hole, which circulates out remaining cuttings. If only one lateral is being jetted, the procedure is complete. If more laterals are to be completed, then the process is repeated as many times as desired. Different companies offer this service commercially, so procedures vary depending on the operators and their proprietary equipment. Some firms mill the casing and then jet the hole; others mill the casing, turn the deflector shoe, mill another hole in the casing, and then jet the holes out into the formation. Others use abrasive sand in the jetting fluid, allowing them to eliminate the use of a cutter and use this sand to cut through the casing instead. Fundamentally, however, these procedures follow the same essential pattern of milling the casing and jetting the hole.
. 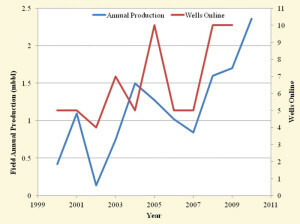 Figure 6 In the past decade, the Donelson West field has seen in an upward trend in production and the number of wells online. After 2007, production steadily increased from less than 1,000 bbls/year to approximately 2,500 bbls/yr. Figure 7 : Monthly oil production for the field shows the step-change in production rates with new wells and the workovers of the old wells. nozzle forward into the formation. The overall nozzle diameter typically varies from 0.5 in. to 0.75 in. and is approximately an inch long. 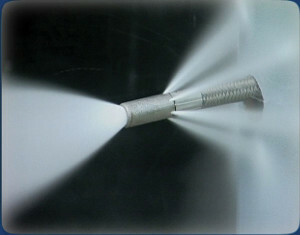 Figure 2 shows the nozzle and the lateral, demonstrating how the forward spray cuts the formation while the rearward spray accelerates the nozzle’s progress into the rock and circulates cuttings from the hole. Figure 3 shows several different jet drilled holes; each was drilled into sandstone via RJD. There are three primary penetration mechanisms that drill the rock in RJD: erosion, pore-elastic tension and cavitation. The high-pressure fluid jet erodes the formation by pumping a relatively small amount of water at high pressure and high velocity through a very small hole. Pore-elastic tension occurs when high-pressure water enters the pore space, increasing the pore pressure and causing the rock to fracture. The sudden increase in pore pressure produces cavitation: fluid-free bubbles are formed in the areas of lesser pressure and immediately implode, causing shockwaves that enhance the fracturing of the formation. In RJD, the CTU resists the weight of the hose hanging in the well, as well as the force created from the backward-facing jets in the nozzle. As a result, the high-pressure hose is subjected to a significant amount of tension, which is beneficial for the operation. This tension pulls the high-pressure hose tight and ensures a straight bore. These forces are illustrated in Figure 4. The fluid pumped through the high-pressure hose to the nozzle varies depending on reservoir lithology and formation fluid properties. In most cases, water is sufficient as it has obvious advantages as an RJD fluid. It is a cost-effective fluid, readily available, easily disposable and has no HSE issues. However, in water-sensitive formations, diesel fuel may be used to drill the radials. Diesel fuel also has solvent properties that may be advantageous for waxy reservoir fluids; it aids penetration by cutting paraffin in the formation and does not emulsify as water might. In carbonate formations, hydrochloric acid is an advantageous drilling fluid that combines the effects of pressure and dissolution of carbonates. Finally, abrasiveness occurs as a result of proprietary blast-sand, which uses the effects of water pressure and sand-blasting to physically erode the casing and formation. The use of abrasives can eliminate the need for a separate cutter to penetrate the casing. Figure 8 : Production from two new wells that were part of a program to produce remaining recoverable reserves were completed with radial jet drilling (RJD) and accounted for 70% to 80% of total lease production. Pumps on two old wells were replaced before March 2012, during which total field production reached a high. The primary benefit of RJD is its economics. It can be a cost-effective method to complete vertical wells to perform like an open-hole horizontal completion. 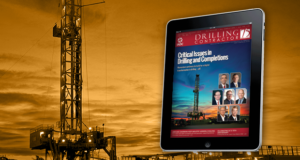 Drilling a new or sidetrack horizontal completion with a rotary rig requires pulling the tubing, killing the well and drilling large-diameter completions at traditional rates of penetration. These expenses can make drilling horizontal wells with a rotary rig cost-prohibitive in a small field. RJD can be accomplished with a small CTU and standing pumping equipment. With the appropriate combination of deflector shoe and tubing diameter, the laterals can be jetted through-tubing, eliminating the need for pulling the production tubing. Utilizing existing well shafts, RJD can also laterally enter areas in a “wheel and spoke” fashion and penetrate up to 300 ft in up to 16 directions at any given depth. The technology has the ability to drill up to eight laterals in two days. 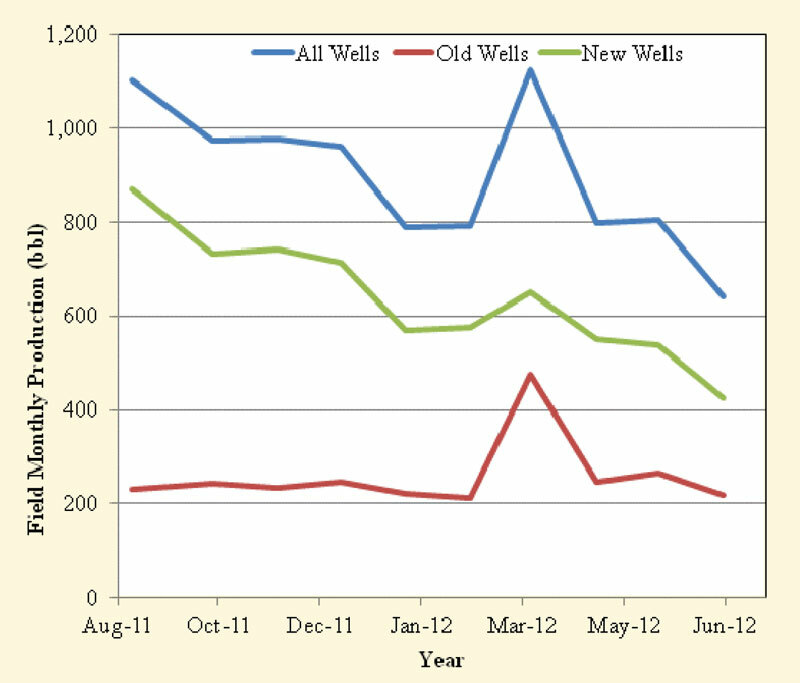 Figure 9 : Before RJD, the old wells struggled to reach 200 bbls/month. After RJD and acid fracturing, production reached approximately 500 bbls/month. In addition, RJD does not utilize traditional drilling mud, bringing both a cost and technical advantage in that there is no formation damage due to filter cake build-up on the rock face. 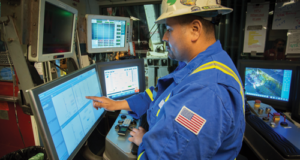 RJD technology allows multi-layer application in thicker reservoir zones, reduces the need for additional stimulation and avoids the problems of changes in wellbore configuration. 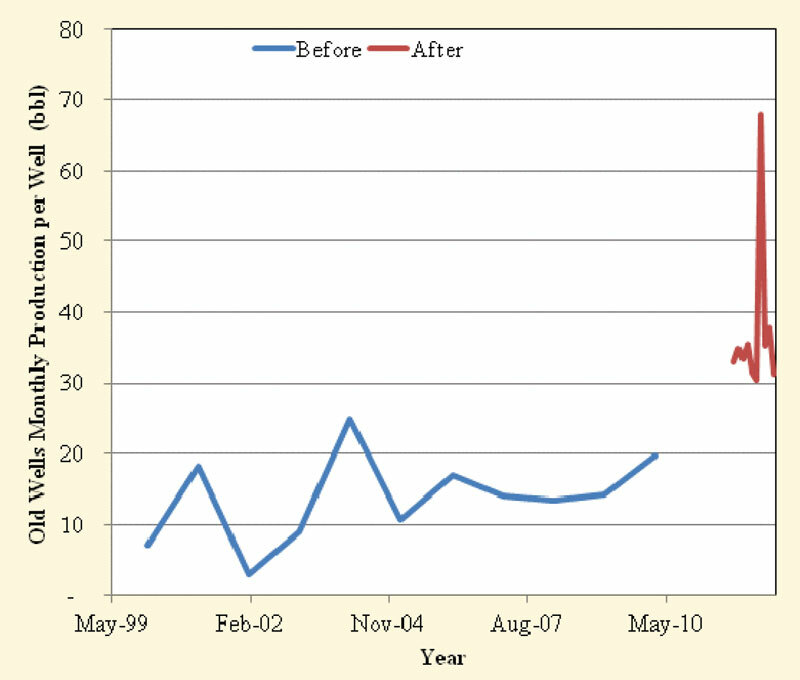 Figure 10 : Data before and after the treatment indicates that old wells are producing more oil – with well production doubling – and making the RJD and acid fracturing campaign a success. The biggest limitation of RJD is that while a jet-drilled lateral begins to mimic the performance of a horizontal completion, it is not a horizontal completion. There is no way to complete the lateral with a liner as it is impossible to run casing into the lateral. Managing future production from the well could be very difficult. Should the operator want to shut off flow from the lateral, doing so could be impossible. Reentering the lateral after it has been drilled also could be very tricky, and pumping some type of squeeze down the lateral could be very problematic. Additionally, there are no surveillance options. If the lateral begins to produce water or gas, there is no way to diagnose which part of the lateral is contributing to the flow because standard logging tools likely won’t fit into the lateral. Directional control of the lateral is also very difficult. This can make reaching specific targets challenging and presents the risk that the lateral could extend out of the target zone and into an undesirable zone that contains either water or gas. Additionally, laterals can prematurely terminate due to fractures, faults or other reservoir heterogeneities. There is no way to steer the nozzle while it is drilling, so if it runs into one of these barriers, it can turn path or lose flow. The Donelson West field is about 1,200 acres reservoir of fine crystalline limestone in Cowley County, Kan. It has an average permeability of 1- 10 millidarcies and an average porosity of 15-20%. The net pay varies from 6-10 ft. To date, the field has been on primary depletion. The formation volume factor of the produced crude is 1.1. Reservoir volumetrics indicate that a total of 2.7 million bbl of oil may have originally been in place. With a 35% recovery factor, as much as 0.95 million bbl may be recoverable. The Donelson West field commenced the production in 1967. During 1968, the field produced 83,000 bbl from 13 wells, after which production began to decline. During 1973, the field produced only 14,858 bbl. Over the past 10 years, production from the field has been very low. From 2000 to 2009, the field averaged 1,033 bbl/year, with a maximum annual production of 1,701 bbl/year during 2009 (Figure 5). Historical production from the field is characterized by immediate and severe decline. Production over the past decade is only a fraction of the field initial production. This is due to the fact that the field is on primary depletion. However, there has been variation in production year by year over the past decade. 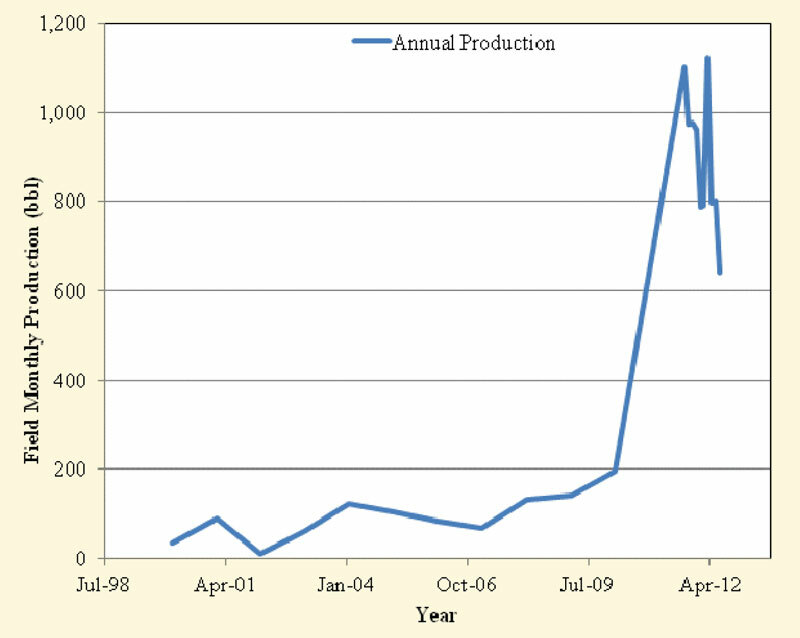 Figure 6 summarizes the field production and producing well count from 2000 to 2010. 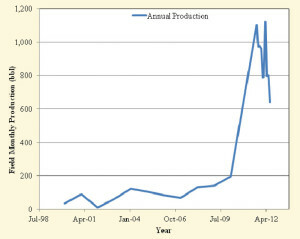 Overall, Figure 6 shows an upward trend in production over the past decade. Throughout that period, there has also been a general upward trend in the number of wells online. From 2001 to 2002, there was a decrease in production, and the number of producing wells went from five to four. 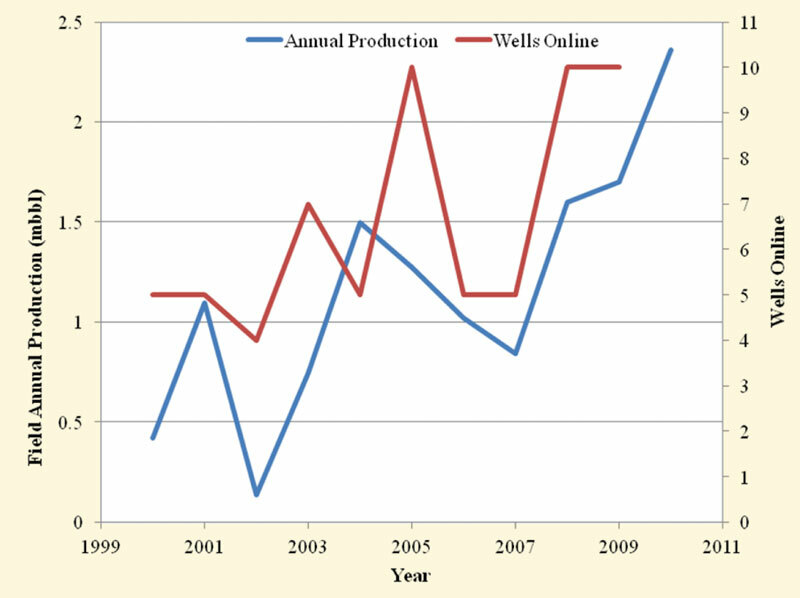 As wells came back online in 2003, production in 2003 and 2004 increased. 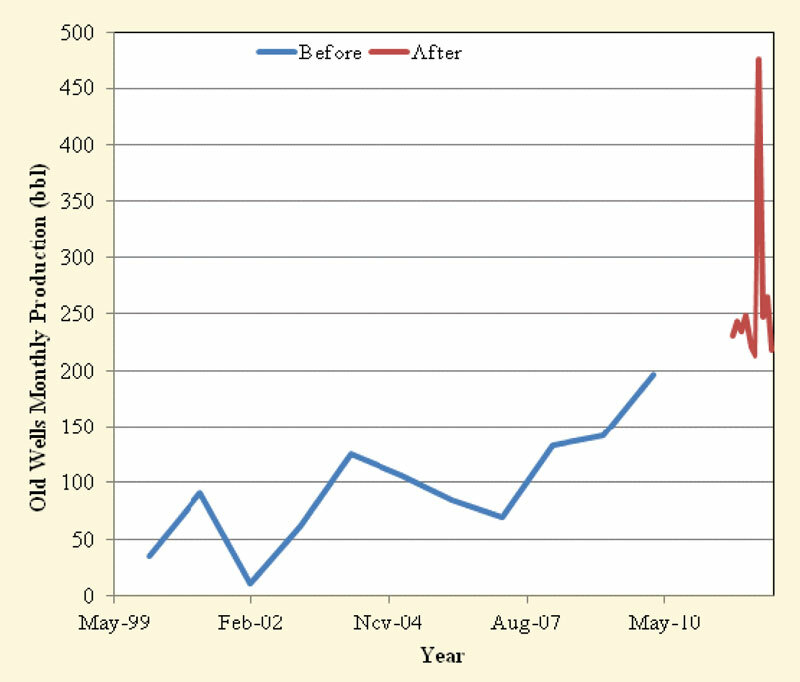 From 2003 to 2004, the well count decreased by two, but by 2005, the well count was up to 10. However, oil production from 2004 to 2007 steadily decreased, which may be related at least partially to the low well count in 2006 and 2007. After 2007, production steadily increased from under 1,000 bbl/year to nearly 2,500 bbl/year. Throughout this time, oil prices were steadily increasing. It is likely that much of the up and down in the well count and modest growth in production was due to the oil price increase and attempts to boost production by optimizing the surface kit. Despite the low production over the past 10 years, the lease has significant potential. Cumulative production from the field through 2011 was about 0.45 million bbl. With an OOIP of 2.7 million bbl, only about 17% of total reserves have been produced, and approximately 2.2 million bbl remain. Since there has been no pressure support, it is possible that the field’s total recovery factor could be improved significantly. If total recovery is increased to 35%, as much as 0.5 million bbl of additional reserves could be recovered. Given the low production, long history, and sizeable remaining reserves, this lease may was a candidate for investment. Table 1: Radial jet-drilled laterals were drilled over several weeks, and total monthly field production after the workovers significantly increased. Prior to the workovers, the field averaged about 157 bbls/month, and after the workovers, the field averaged 938 bbls/month. The field was originally developed with vertical completions. These completions were followed by acid/nitrogen fracturing. The wells were not all identically treated, and those treated with between 10,000-15,000 gal of acid and 125,000 Mcf nitrogen produced at higher rates than other wells fractured with less acid. 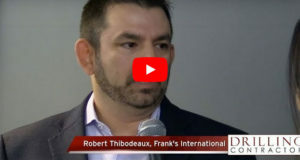 A new operator acquired a 320-acre lease in the field in late 2010 and began to develop a program to produce the remaining recoverable reserves. The overall plan consisted of stimulating the existing wells and initiating an infill drilling program. This plan was completed in several phases. 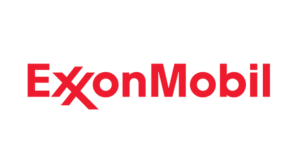 The initial phase consisted of recompleting and stimulating eight existing wells and drilling two new wells in the lease. Ultimately, the field will be drilled on 10-acre spacing, and each well will be completed with RJD laterals. After the laterals have been completed, each will be hydraulically fractured with 15,000 gal of acid and 250,000 Mcf of nitrogen. day to jet. The old wells were completed with four 600-ft laterals that each required 500 gal of acid to drill. The new wells were also completed with four 600-ft laterals but with 400 gal of acid for each lateral. After the jetting, each well was stimulated with a 15,000-gal acid frac followed by 250,000 Mcf of nitrogen. After fracturing, the wells were put on production. Both of the new wells came on strong with flush production, and seven of the existing wells came on, with one of the existing wells never coming back online. production, the overall success of the 10-well programs was excellent. Table 1 summarizes total monthly field production prior to the workovers, as well as total monthly field production after the workovers. Table 2 : After the radial jet drilling (RJD) workovers, production from the old wells consistently reached the range of 250 bbls/month for nine months. 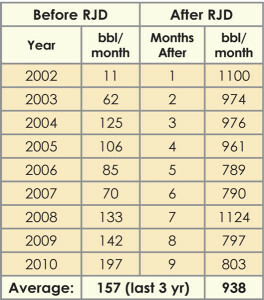 Before RJD, from 2008 to 2010, the field averaged 157 bbls/month. During 2006 and 2007, the field was producing from only five wells. From 2008 to 2010, all 10 of the wells produced. 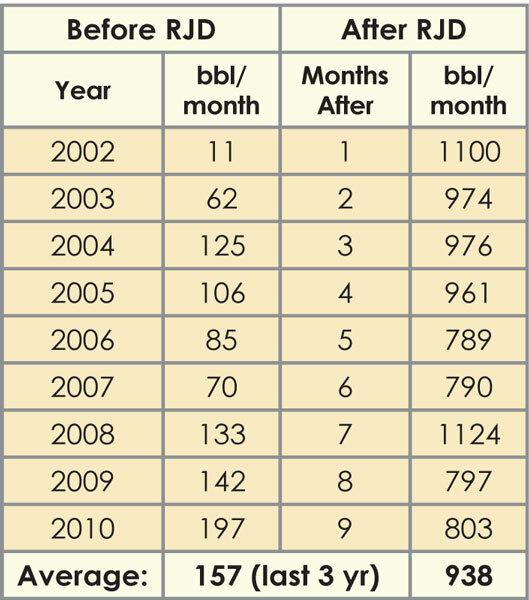 As Table 1 indicates, prior to the workovers, the field was averaging about 157 bbl/month over the past three years. After the workovers, the field averaged 938 bbl/month, a six-fold increase. 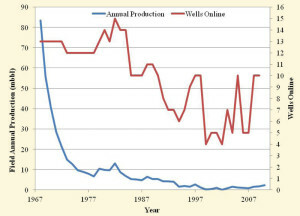 Figure 7, a plot of the monthly production, clearly shows this step-change in production rates that occurred with the new wells and the workovers of the old wells. Again, the step-change in production is clear. However, the production numbers after the workover include two new wells that account for a significant fraction of field production. Fortunately, there is adequate production information to separate production of the new wells from the production of the old wells. Table 3 : Monthly average production per well after the treatments increased two-fold for the old wells. 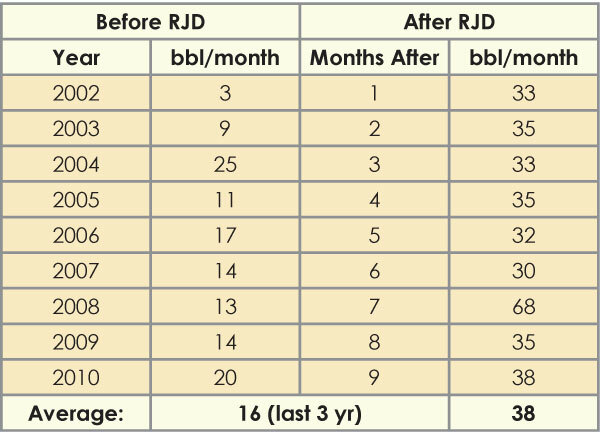 Average rates for the three years before the RJD work was 16 bbls of oil per month. After the treatments, the per well production averaged 38 bbls/month. account for 70% to 80% of total lease production. These two new wells came on strong, and as the adjacent pressure has depleted, their production has declined. The remaining 20% to 30% of current lease production has been consistently better than 200 bbl/day. Figure 8 does indicate abnormally high production during March 2012. Just prior to this period, the pumps on the two old wells were replaced. 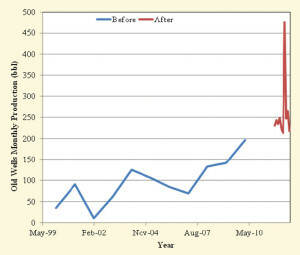 The pump replacement resulted in short-term production benefits that are primarily responsible for the production increase. 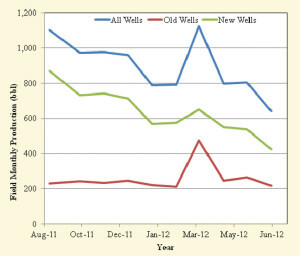 During June 2012, production from both the old and new wells was down slightly. During this time, there were production disruptions associated with additional infill drilling and bringing those new wells online. 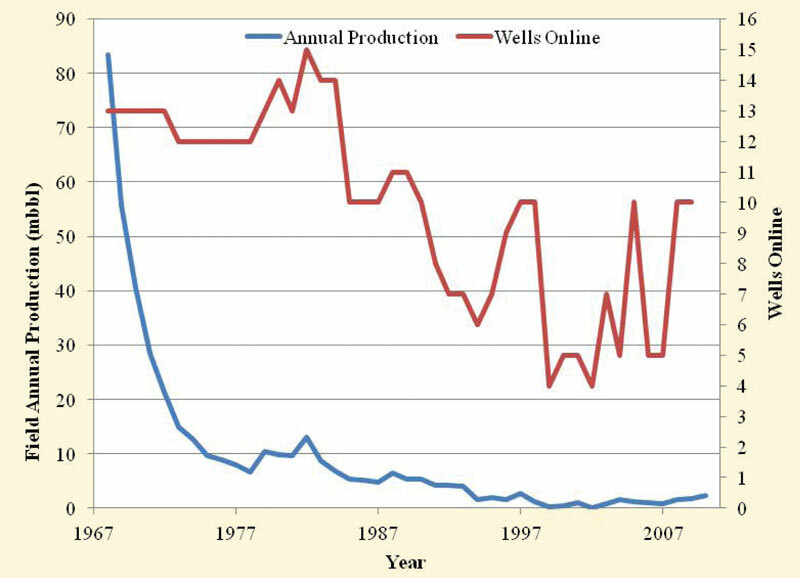 The before and after comparison of old well production is shown in Figure 9. The step-change in production after the RJD and acid fracturing is evident in Figure 10. Prior to RJD, the wells struggled to reach 200 bbl/month. Afterwards, production reached nearly 500 bbl one month and is consistently in the range of 250 bbl/month. Table 2 presents monthly production data for the old wells before and after the workovers. From 2008 to 2010, the field averaged 157 bbl/month from the old wells. 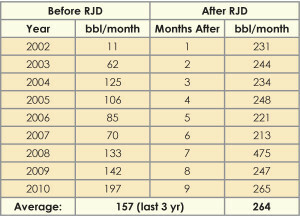 For the nine-month period after the RJD/acid fracturing treatment, the wells have averaged 264 bbl/month. However, much of the variation in historical production is due to fluctuating well count. During periods when wells were shut in, production was down. Table 3 summarizes average monthly production per well, and Figure 11 is a plot of this data. After normalizing for well count, the success of the treatment is evident. 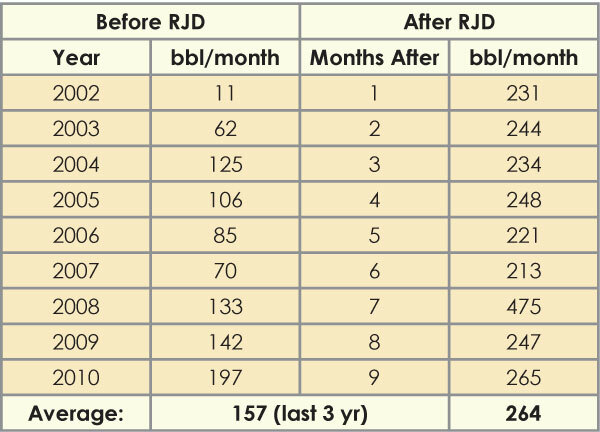 The per well average production rates for the three years prior to the RJD work was 16 bbl/month of oil. 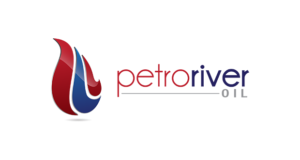 After the treatments, the per well production rate is on average 38 bbl/month. Excluding the seventh month, during which benefits from two pump replacements were seen, the monthly average rate per well was 34 bbl. This is a two-fold increase in production. 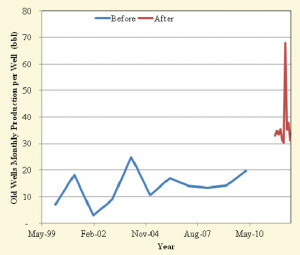 Figure 10 is a production plot of the monthly per well average production rates before and after the RJD/acid fracturing treatment. The data indicates that the old wells are producing more oil, and on average, each of the producing wells is producing more oil except for the one well that never came back. The overall RJD/acid fracturing campaign was a success, with well production doubling afterward. This reservoir has suffered from significant pressure depletion. Initial production declines were severe and began immediately. There has never been any kind of pressure support. As a result, the field is producing at very low drawdown with beam bumps. Much of the pumping equipment was repaired or replaced during the period when the RJD/acid fracturing was being completed. Additionally, there is no available production data between the completion of the jet drilled laterals and the acid fracturing. The overall production increase from the old wells is likely due to at least some interaction between the new pumping equipment and the RJD/acid fracturing. Some of the production increase is likely due to higher drawdown (as in the seventh month when two pumps were replaced,) and some of the production increase is due to the RJD/acid stimulation. Some of the productivity increase is due to the laterals, and some is due to the acid fracturing. Unfortunately, there is no way to separate the benefits of these due to scarcity of data. Finally, metering at the field is also very basic. Oil production is based on production over relatively long periods of time, and sophisticated flow measurements and data simply don’t exist. Historical production is based on Kansas Geologic Society databases. 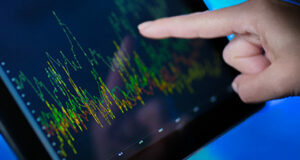 Data is available annually, and well counts may mask field performance. The observable success of the RJD/acid treatments is the pronounced step-change in oil rates. However, the real question is under what mechanism does RJD impact well productivity. There are several possible scenarios. The first is simply that the laterals expose more rock face and increases the amount of rock that can flow. It is also possible that the laterals change the flow regimes from radial flow to something that behaves more like a horizontal completion with more linear flow. In this case of vugular limestone, the idea may be that the laterals have opened up some of the vugularity or other diagenitic features in the formation that is contributing to the flow. Additionally, the use of acid as a jetting fluid and subsequent acid fracturing may be a contributing factor. It is probable that the long horizontals, though small in diameter, are able to aid fracture propagation. Four laterals per well, each penetrating 600 ft into the formation, could be a significant head start for fracture propagation. Conversely, they could also hinder fracture propagation if the laterals themselves contribute to leak-off and the fluid can’t sufficiently break down the formation. Additionally, the effect of acid in limestone is well understood to be of a significant benefit. It is also possible that the orientation of the laterals is important. Whereas hydraulic fracturing tends to propagate fractures parallel to the formation’s natural fractures, RJD can enter the rock perpendicular to the natural fractures and open up flow through them. The particular mechanism that caused the productivity increase at this field is uncertain, but it is probable that it is a combination of some of these factors. Prior to the lease changing hands, this field was essentially shut in, with only sporadic production that amounted to about 150 bbl/month. Two new wells were drilled, which were completed with RJD laterals and fractured with acid and nitrogen. Eight old wells received a similar RJD/ acid fracturing treatment. Only one of the old wells that were treated failed to produce oil after the work. After this work, the field average production was more than 900 bbl/month. Analyzing the production from the new wells and the old wells separately indicated that between 20% and 30% of this total production came from the old wells. This represents a two-fold increase in production from the old wells on an average per well basis. Despite its limitations, RJD can be effective for completing both new and workover wells with radials up to 1,000 ft due to its low environmental impact, economical enhancement of reservoir productivity, suitability for many formation types, enhanced effectiveness of subsequent well stimulation treatments, and the speed at which laterals can be drilled. Future work might focus on comparing the productivity of jet-drilled laterals to traditionally drilled horizontal wells, skin factors, and comparison of theoretical productivity predictions of horizontal wells to actual productivity of horizontal jet drilled laterals. SPE/IADC 163405, “Novel Technique to Drill Horizontal Laterals Revitalizes Aging Field,” was presented at the 2013 SPE/IADC Drilling Conference, 5-7 March, Amsterdam. Abdel-Ghany, M. A.; Siso, M.; Hassan, A. M.; Pierpaolo, P;, and Roberto, C. 2011, “New Technology Application, Radial Jet Drilling Petrobel, First Well in Egypt,” SPE 2011-163, 10th Offshore Mediterranean Conference and Exhibition, Ravenna, Italy, March 23-25. Bruni, M.; Biassotti, H.; and Salomone, G. 2007, “Radial Drilling in Argentina,” SPE 107382, SPE Latin American and Caribbean Petroleum Engineering Conference,Buenos Aires, Argentina, April 15 -18. 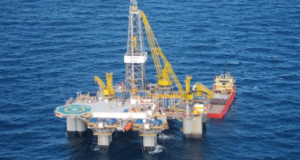 Buckman Jet Drilling, 2010, Leading Innovators in Jet Drilling Technology, www.buckmanenergyservices.com. Dickinson, W. and Dickinson, R. 1985, “Horizontal Radial Drilling System,” SPE 13949, SPE California Regional Meeting, Bakersfield, California, March 27-29. Dickinson, W.; Dickinson, R.; Herrera, A., Dykstra, H.; and Nees, J. 1992, “Slim Hole Multiple Radials Drilled with Coiled Tubing,” SPE 23639, Second Latin American Petroleum Engineering Conference, II LAPEC, Caracas, Venezuela, March 8·11. Dickinson, W.; Dykstra, H.; Nordlund, R.; and Dickinson, R. 1993, “Coiled-Tubing Radials Placed by Water-Jet Drilling: Field Results, Theory, and Practice,” SPE 26348, 68th SPE/ATCE, Houston, Texas, October 3-6. Dickinson, W.; Pesavento, M.; and Dickinson, R. 1990, “Data Acquisition, Analysis, and Control while Drilling with Horizontal Water Jet Drilling Systems,” SPE 21602, International Technical Meeting, Calgary, Canada, June 10 – 13. Gidley, J.L. ; Holditch, S.A.; Nierode, D.E. ; Veatch, R.W. 1989. “Recent Advances in Hydraulic Fracturing,” Monograph Series, Vol. 12, Richardson, Texas: Textbook Series, SPE. Kansas Geological Survey, 2005, “Stratigraphic Succession in Kansas,” www.kgs.ku.edu/Publications/Bulletins/189/07_penn. html. Kansas Geological Survey, 2010, “Stratigraphy of the Marmaton Group in Kansas,” www.kgs.ku.edu/Publications/Bulletins/58/ 04_ strat.html. Marburn, B.; Sinaga, S.; Arliyando, A.; and Putra, S. 2012, “Review of Ultra Short-Radius Radial System (URRS),” IPTC 14823, International Petroleum Technology Conference, Bangkok, Thailand, February 7-9. RadJet. 2012, “RadJet Technology,” http://www.radjet.com/technology/radjet-vs-competitors/. Towler, B.F. 2002. “Fundamental Principles of Reservoir Engineering,” Textbook Series, Vol. 8 (3-4), Richardson, Texas: Textbook Series, SPE. Well Enhancement. 2008. “Radial Jet Enhancement Technology,” www.encapgroup.com/cms/index.php?id=15. Yonghe, L.; Chunjie, W.; Lianhai, S.; and Weiyi, G. 2000, “Application and Development of Drilling and Completion of the Ultra Short-Radius Radial Well by High Pressure Jet Flow Techniques,” SPE 64756, SPE International Oil and Gas Conference and Exhibition in China, Beijing, China, November 7–10. Woking in Oil & Natural Gas Corporation Limited, a national oil & gas company. Want to use this technology for tigt carbonate reservpoirs. PL mail me the details. need your advise of our mature field at Ahmedabad project,India ,Oil and natural gas corporation. 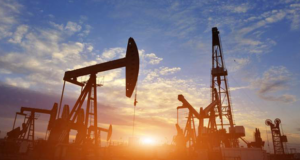 Our O & G company is based in Abilene, TX and we are looking for a reputable RJD company. Hi! Do you have any experince in CBM fields? Could you please mail me the details. Would like to use in CBM field in india.